Brooklyn Borough President Eric Adams speaks in front of City Hall on Wednesday, December 5, 2018. (Justin Mitchell/BKLYNER). 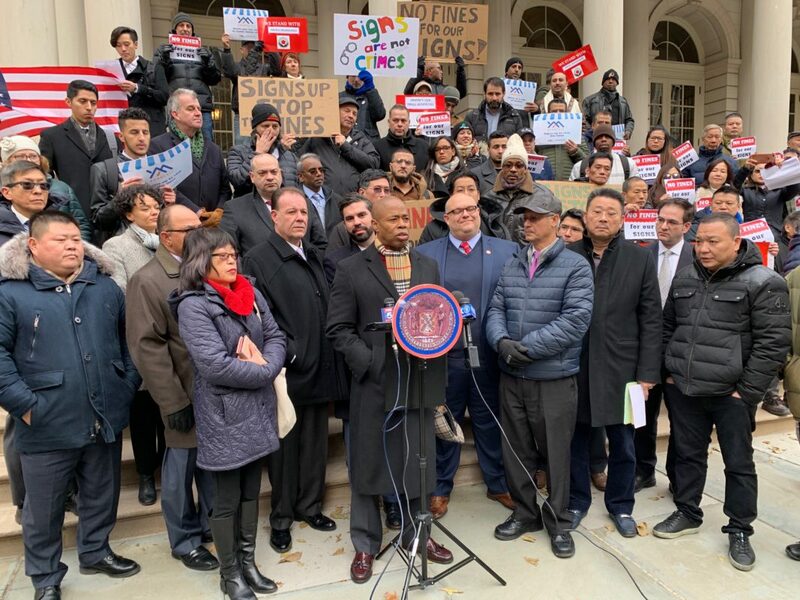 NEW YORK – From City Hall to Sunset Park, city officials scrambled this week to help constituents caught up in the wave of sign and awning violations sweeping the city, which recently hit Brooklyn – especially hard in Bay Ridge and Sunset Park. Brooklyn Councilmembers Justin Brannan, Carlos Menchaca and Rafael Espinal rallied Wednesday afternoon on the steps of City Hall with dozens of small business owners and other officials, promoting Espinal’s bill seeking a 6-month moratorium on violations, a resolution of any judgments issued in the last two years, and at least partial refunds for any business owners who have already paid fines. They are also calling for increased outreach by the Department of Buildings and Small Business Services to educate business owners about the rules. Brooklyn City Councilman Rafael Espinal speaks in front of City Hall as fellow Councilman Justin Brannan looks on. (Justin Mitchell/BKLYNER). All the members present, plus Brooklyn Borough President Eric Adams, slammed the wave of complaints and violations, which have led to combined fines and expenses in excess of $10,000 for some businesses as they pay their fines, remove signs that are in violation, and install new ones. “These are signs, and signs are not crimes,” Adams said, echoing a slogan chanted by the rally participants. “The bottom line is, the city government should not have an arrow in its quiver that with the stroke of a pen can effectively shut down a small business,” Brannan said. The Department of Buildings says it is not targeting small business owners, but merely responding to 311 complaints, which have more than doubled in the last year, often on businesses that have used the same signs for decades. When asked about Espinal’s bill, the DOB said it had not yet seen the final version. “The Department will review the proposed bill once we receive a finalized copy of the legislation,” they said in a statement. One business owner, identifying himself as “Mr. Bezaar,” had harsh words for the city and the DOB. “They’re joyously slaughtering the small businesses, and this is a heinous and deliberate act of defacing New York City,” he told Bklyner after the rally. Officials also sounded the alarm on the “weaponization” of New York City’s 311 service. Many residents suspect someone is misusing the system to drum up business or settle scores. 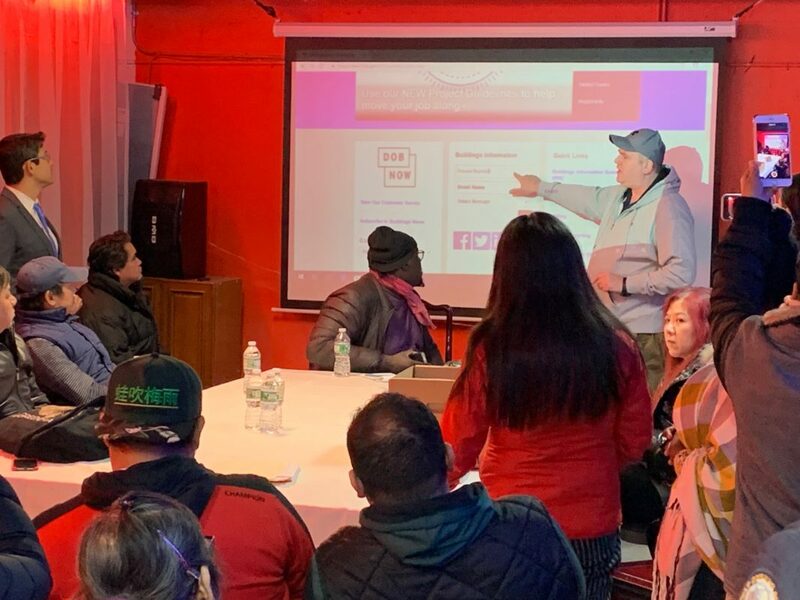 City Councilman Carlos Menchaca (far right) speaks to Sunset Park residents during a community meeting on Wednesday, December 5, 2018. (Justin Mitchell/BKLYNER). 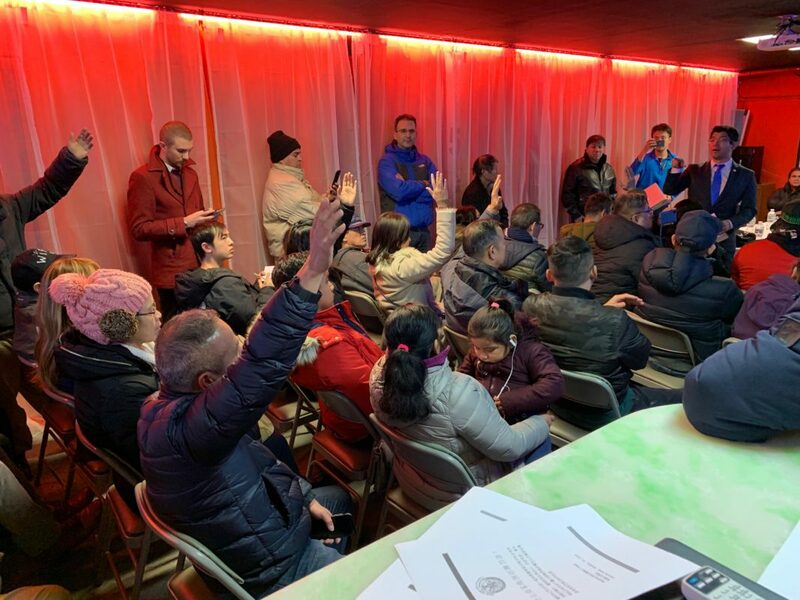 Later Wednesday, Carlos Menchaca returned to Sunset Park for a marathon meeting conducted in English, Chinese and Spanish to bring local business owners up to speed on lawmakers’ plans plus how to ensure their signage is legal. David Nussbaum of the Department of Buildings walked residents through the regulations, as well as how to look up whether their business has a complaint on the DOB website. He also provided a packet he had personally prepared explaining the regulations, which mostly appeared to be lifted from DOB’s website. David Nussbaum of the Department of Buildings speaks to a community meeting in Sunset Park on Wednesday, December 5. (Justin Mitchell/BKLYNER). Almost all the attendees stayed till the end of what turned out to be a more than a two-hour-long meeting and Menchaca said he hoped engagement like that would continue. “When people feel heard, and that the government is working for them, they’re going to stick around, they’re going to keep bringing energy to this,” he said. Lawmakers appear optimistic they can get Espinal’s bill passed by the end of the year. Espinal said he is currently in negotiations with the office of Mayor Bill de Blasio, and thought the two sides were “days away” from resolving their differences. 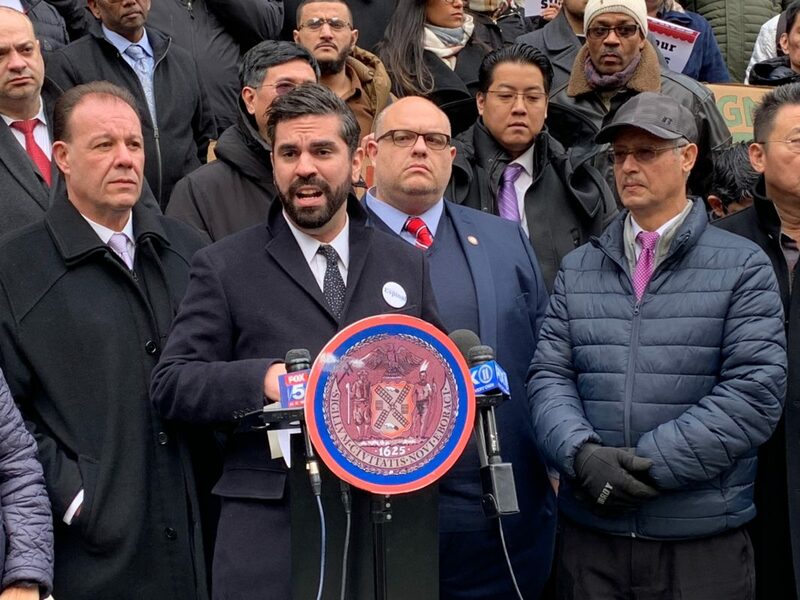 “We’re putting extreme pressure on the mayor’s office, because the city council’s very interested in getting this bill passed before the end of this year, which is in a few weeks,” he told Bklyner. Espinal’s office said the main sticking point was exactly how much financial assistance the city can provide business owners that have either already paid their fines or have fines outstanding. 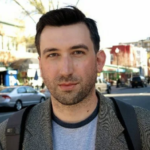 “They get it, it’s just a matter of time,” Brannan told Bklyner when asked about the Mayor’s office, adding he thought the bill would be passed shortly. “It’s going to be weeks, it’s going to be a couple of weeks, if that,” he said. (We reached out to the Mayor’s office and will update with their response, if we hear back). UPDATE at 6pm to include the DOB’s statement. I was born and raised in Fairbanks, Alaska. My life's journey has led me to Colorado, Oregon, Prague, Cambodia, South Korea, Chicago and Washington, DC. Now on my second Brooklyn stint and eager to tell some good stories. Good! Now we need to know who set the minimum fine at $6,000. What with new minimum wage, paid sick leave this is deal-breaker and thus a jobs killer for small biz. It goes back two years! What took so long. A lot of people have been hurt.